The new Kettler Race indoor training bike has been redesigned with a new frame and multi-position handlebars for all training positions. The high-resolution LCD training computer shows eight readouts for data including speed, RPM, time, distance, Watts, and more. It has a recover feature that provides a grading of cardio wellness indexed from 1 to 6 to track improvement. Q-factor pedal spacing of 6.5"
UPDATE: The Race Indoor Training bike has been discontinued and is no longer available. You can check out all of the latest models on sale now to find one that suits your needs. Equipped with the patented Kettler eSYS System, the Race Indoor Training Bike offers multi-point adjustments for superior comfort and fit. The racing saddle is micro-adjustable in tilt, height, and fore/aft on the post. The triathlon handlebars can be moved closer to the saddle or further back, and changed in height. You can use the comfortable elbow pads for training, or adjust the handlebars to put you in an upright, relaxed seat position. The Kombi-click pedals featuring an SPD system on one side for cycling shoes and a regular pedal grip on the flip side. The Q-factor is a narrow 6.5" in crank width to lessen stress on hips when pedaling. Built on a solid high-carbon steel frame, the Kettler Race indoor training bike features a powerful and frictionless magnetic brake system, a smooth 39-lb flywheel, a noise-less grooved Poly “V” drive belt with protective coating, and superior sealed ball bearings. The variable resistance levels of 1 through 10 give you the option of increasing the tension in the various pedaling stances from seated to standing. At-home assembly is easy with the assistance of clear illustrations in the bike’s manual. The rest of the instructions are in German, but you should have no trouble putting the bike together. 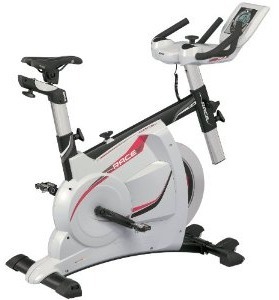 This indoor training bike offers a very different look from other Spinner-type bikes on the market. Some users might find the Kettler Race appealing while others think it looks clunky and not sporty like Star Trac, Livestrong, or Vision indoor cycles. 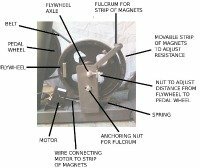 It looks like you’ll have to remove the protective shroud to get at the brake pad to replace it periodically, while the other bikes are designed for quick service. The shroud keeps the sweat from dripping onto the flywheel as well, but it also makes it look less like a road bike and more like a stationary bike. 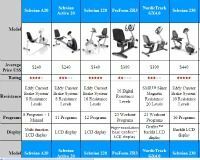 This $1,499 well-engineered trainer is good quality bike, but the Kettler Race indoor training bike wouldn’t be our choice over the others listed above.